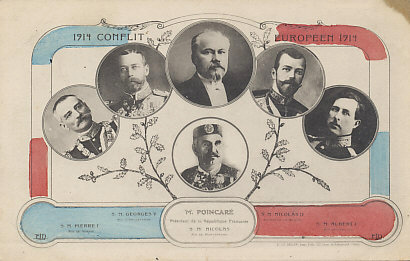 Leaders of the first six Allies: King Peter of Serbia, King George V of Great Britain, President Poincaré of France, Tsar Nicholas II of Russia, King Albert of Belgium, and Nicholas of Montenegro. Albert Meinrad, King Albert I of Belgium, ascended to the throne in 1909 on the death of his uncle Leopold II. On August 5, 1914, with German troops already in his country, the King addressed the Belgian Parliament calling for union between all parties and ethnics groups. The deputies greeted his speech with cheers and, after the King's departure, voted to reject the German request to cross Belgium unmolested to attack France. Albert took command of the Belgian Army, which was driven from its defensive lines first on the Meuse River, then the Gette, before retreating to the fortress city of Antwerp. 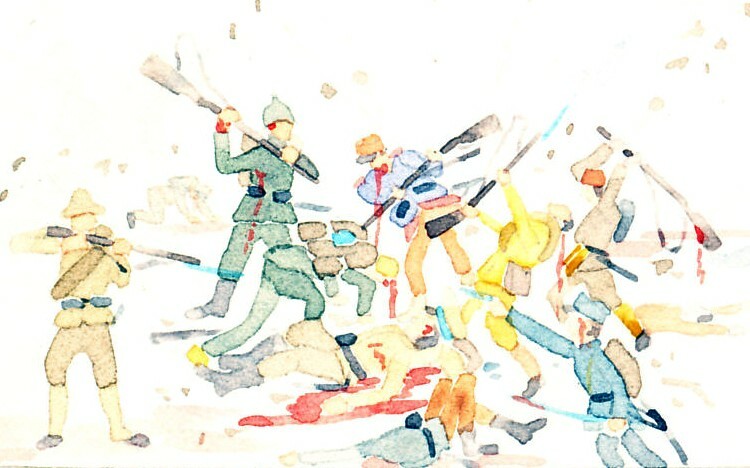 The Belgians sortied from Antwerp during the Battle of the Marne and the Race to the Sea, in both cases, pinning down German forces needed elsewhere. Retreating from Antwerp before its occupation by German forces on October 9, 1914, the Belgians helped hold the English Channel coast and channel ports, critical to Britain's ability to supply its forces on the continent. In the Battle of the Yser, part of the Battle of Flanders, King Albert and his army prevented German seizure of the coast, in part by inundating the low-lying farmland on the Yser Canal. With nearly all of their country occupied, King Albert and the Belgian's held this corner of the country through the remainder of the war. Queen Elisabeth, Albert's wife, was a German princess who served as a nurse during the war.